The ClampOn Subsea CEM measures and monitors wall thickness loss in pipes, plates or other metal structures. The instrument uses Acoustic Guided Lamb Waves (AGLW), a technology that gives an average wall thickness reading for a large section of pipe. Transducer pairs operate in a pitch-catch mode and use the ultrasonic waves to give the average wall thickness between the transducer pairs. The transducers are fixed at pre-determined points on the pipe to monitor the wall thickness loss in sections of the pipe typically up to two meters long. The CEM unit consist of up to eight transducers and an electronics unit that handles all signal acquisition and processing. 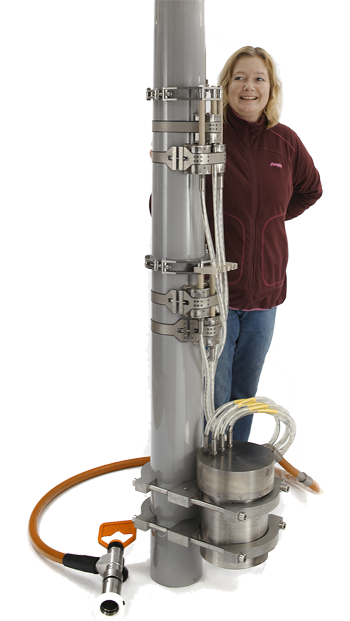 The subsea CEM can utilize up to 32 transducers, increasing distance to a maximum of 8 meters. Wall thickness trends are generated automatically and can be observed in real-time on a computer running ClampOn CEM software, or logged internally in a data logger. Wall thickness map (left) obtained on a pipe with two circular arrays of transducers (right). Actual wall thickness 0.76 mm, pipe OD 8.625 in.